This big hearted animated film from 2002 stars a young Hawaiian girl who befriends an alien. Many Disney fans are against the Stitch’s Great Escape attraction inside of Tomorrowland at the Walt Disney World Resort. However, you cannot help but smile at his antics in the film. The film opens with an extra-terrestial court setting. Experiment 626 (Stitch’s name on his planet) is known as the first of a new species. The Grand Councilwoman of the planet orders him to be taken away in a desert asteroid. On the way, he escapes with a flying vehicle of sorts, heading to a planet called “Eee-arth.” Meanwhile, his creator named Jumba is put into prison and a one-eyed loopy-minded creature by the name of Pleakley is put in charge of his welfare. We pan over to Hawaii where the inhabitants are catching waves at a beach. We see an adorable little girl run over to take a picture of a rather large man wearing sunglasses and attempting to eat an ice cream cone, who appears a few other times in the film. She arrives just in time to her hula concert. We meet Nani, Lilo’s older sister, who is the parental figure in her life. (We find out later on that their parents had sadly passed away.) We meet an interesting social worker named Mr. Bubbles who checks in periodically with how they are doing. Unfortunately, Nani cannot seem to have a grasp on the situation and continually loses both patience and the ability to control her little sister. We then see the first “real talk” scene of the film where Nani and Lilo discuss the meaning of ohana: “ohana means family, and family means nobody gets left behind…or forgotten.” Lilo and Nani see an explosion and wonder what it is. Little do they know they are in for the ride of a lifetime. The next day, the sisters go to the kennel to adopt a dog. Stitch has, of course, crashed onto Earth and broken into the kennel. The first interaction between Lilo and Stitch is awesome – she says hi and he returns her greeting with an excited “HIIIIII!” Her eyes bug out of her head and she immediately wants him. Lilo spends time trying to teach Stitch how to be a regular “dog.” Nani works at a restaurant where fire dancers put on shows – in fact, there is one in particular named David who likes her. Chaos erupts thanks to Stitch and Nani is fired. Nani’s explanation to Lilo as to why she was let go was hilarious – “The manager is a vampire and wanted me to join the legion of the undead” to which Lilo quietly responds “I knew it.” Another great scene is when Stitch finds a blender in the kitchen and proceeds to turn it on and open the top, which results in him screaming. Nani attempts to get a job but Stitch manages to ruin every interview she has by causing some form of trouble. At the final interview for a lifeguard position on a beach, Stitch comes out dressed as Elvis Presley to entertain beachgoers (my least favorite scene of the film – way too corny). Mr. Bubbles witnesses this going on and basically informs Nani that she should be out of Lilo’s life. Meanwhile, Jumba and Pleakley have been on Earth for a while and are also checking out what’s going on, planning how they will catch Stitch. Next comes the saddest part of the entire film. A devastated Stitch reads part of The Ugly Duckling and says “I’m lost” out loud. Per usual, I began to cry hysterically. His little voice and ears bent downward are enough to cause the heartstrings to break. Jumba finds Stitch and tells him that he will never belong. Stitch replies with the other heart wrenching line of the film, stating that he was waiting for his family. The last part is a bit all over the place while still well done. David finds Nani a job offer. Jumba and Pleakley bombard the house in hopes to catch Stitch. The house unfortunately gets blown up in the process. Mr. Bubbles puts Lilo in the car and Stitch gets captured. Lilo escapes the car and ends up being stolen with Stitch. 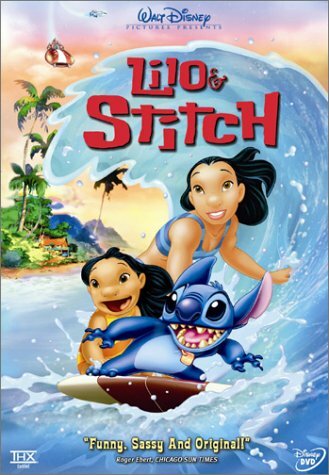 An elaborate rescue mission takes place which ends in the safe return of both Lilo and Stitch. The Grand Councilwoman arrives on Earth to bring Stitch back to their planet, but after his heartfelt speech, the Councilwoman decides that he can stay on our planet. Jumba and Pleakley turn into good guys and in turn help the family build a new house. The film ends with photographs taken of the happy family. Lilo was voiced by Daveigh Chase who continued to voice Lilo for the sequels, video games and the animated series; she has also appeared in many television shows. Christopher Michael Sanders voices Stitch. Sanders was also a director for the film. David Ogden Stiers portrays Jumba; Stiers has been in many films and also provided the voices for Governor Ratcliffe and Wiggins in Pocahontas as well as the voices of Cogsworth and of the Narrator in Beauty and the Beast. Lilo & Stitch was directed by Dean DeBlois and the above mentioned Christopher Michael Sanders. DeBlois and Sanders have also been involved in the writing department of Mulan. 1.) During the photo montage at the end, the film pays homage to Norman Rockwell’s Thanksgiving painting. 2.) The film earned $145 million at the box office, Disney’s highest earned film since 1999’s Tarzan. 3.) The producer Clark Spencer said the story was originally supposed to take place in Kansas rather than on Kauai. 4.) During the scene where Lilo shows Stitch where he will sleep, a Hidden Mickey is seen in the upper right hand corner of the screen. 5.) In the scene at the hotel, Stitch carries a rose which was inspired by an animation student who gave flowers to fellow animation students as well as animators themselves at the annual Disney Institute animation classes. Lilo & Stitch is a highly enjoyable film. With classic animation and charm galore, this is an absolutely heartfelt piece from start to finish. Despite a couple moments of Stitch’s occasional gross humor, you immediately forget about it and instead fall in love with all of the characters. While this is not a personal favorite of mine, it is indeed one which I would call an excellent animated film and one worthy of watching every year. I have just determined this situation to be far too hazardous.